Mark Wednesday, Feb. 20, on your calendar as "LunarEclipse Night," for if the weather is fair you should have no difficultyobserving a total eclipse of the moon. 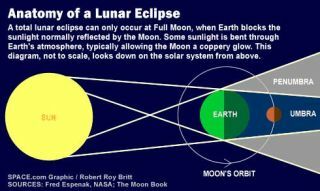 The eclipse will be visible wherever the moon is above thehorizon during the time frame that the eclipse is taking place. As it turnsout, North and South America will turned toward the moon and will be in excellentposition for this sky show. Europe, Africa and a part of western Asia will also be ableto see the eclipse, although for these regions the event will take place inhours just before sunrise on the morning of Feb. 21. All told, given clear skies, about three billion potentialeclipse viewers will be able to partake in the spectacle of the full moon becoming completelyimmersed in the Earth's shadow. This will be the third total lunar eclipse within the pastyear. The previous two favored different parts of North America, but this onewill be readily visible from start-to-finish across much of the continent,weather permitting. The total phase will last 51-minutes and begins at 10:01p.m. EST (7:01 p.m. PST). Because some of the sunlight striking the Earth is diffusedand scattered by our atmosphere, the Earth's shadow is not completely dark. Typicallythere are coppery red and orange hues cast over the moon at and near totalityfrom sunlight refracted from our atmosphere around the edge of the Earth,giving the moon the appearance of an eerie glowing ball. As a bonus, during the eclipse the moon will be situated, inour sky, near the planet Saturn and the bright bluish star Regulus in theconstellation of Leo. The effect will be to create a uniquely beautifultriangle in the sky consisting of the totally eclipsed moon, a bright naked-eyeplanet and one of the 21 brightest stars in the sky. Editor's Note: SPACE.com will provide a completeeclipse viewer's guide Feb. 15.